Mineral Fusion Lip Gloss in Captivate is designed to give lips a glossy, shimmering copper finish as it deeply nourishes and hydrates. Formulated with antioxidant-rich White Tea Leaf oil, Honeybush Leaf oil and Pomegranate oil to help protect the lips from sun and environmental damage, it also contains Sesame Seed oil, Sunflower Seed oil and Vitamin E to moisturise and soften. This luxurious lip gloss has a smooth, creamy texture that goes on light and is non-sticky. Aloe Vera, Cacao, Calendula, Coconut Oil, Pomegranate, Rosehip Oil, Rosemary, Sesame Oil, Shea Butter, Vitamin C, Vitamin E, White Tea. 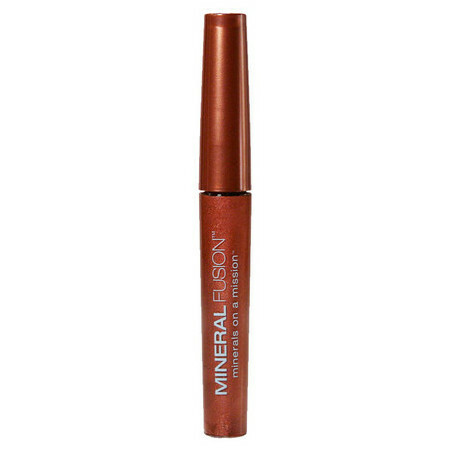 This is a nice gloss that you can apply as lightly or heavily as you like. The colour is not quite what I expected but it's still lovely - I prefer more of an orange copper than a red copper. Smells great! More of a red berry colour than copper. The gloss glides on nicely with a great scent but unfortunately doesn't last. The gloss doesn't ball like other glosses and has a non sticky consistency.